Featuring The Independence Stamp Album which has illustrated loose-leaf pages for U.S. stamps. The kit also contains 50 All different U.S. stamps, magnifier, 100 stamp hinges and more! Perfect for a novice or young collector! Featuring The Traveler Stamp Album which has spaces over 10,000 stamps in a colorful loose-leaf binder. 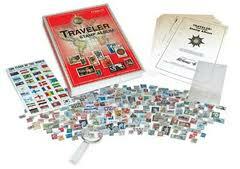 The kit also contains 100 All different World Wide stamps, magnifier, 100 stamp hinges and more! Great for the beginner!